The Keenan family name has been associated with the fish business for three generations. 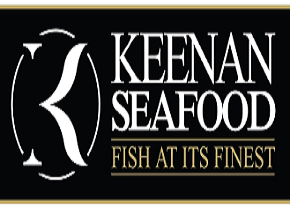 The business was originally founded in 1942 and the company now trades as Keenan Seafood Limited under ownership of Gerard Keenan. The company operates from a modern purpose built facility (which has been fitted to the highest hygiene standards) based on the outskirts of Belfast. A fleet of refrigerated vehicles make daily deliveries to their wide customer base throughout Northern Ireland. Today the company specialises in supplying a full range of fresh and frozen seafood to many of the leading hotels, restaurants and contract catering outlets. Fish is sourced each morning from the local Northern Ireland ports as well as from Scotland and the West of Ireland. Only the finest quality seafood is selected and transported to their premises for further processing and order assembly. Keenan Seafood also imports a wide range of fresh exotic seafood lines each week from Turkey, Sri Lanka and the Azores to offer a fuller choice of products to its ever discerning customer base.